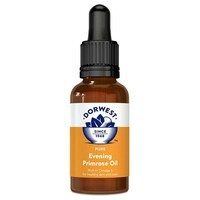 Dorwest Evening Primrose Oil Liquid for Dogs and Cats contains a high level of gamma linolenic acid (GLA) and all its associated benefits in an easy to give liquid. An ideal formulation for cats and small dogs to reduce scurfiness or dryness, and to help maintain healthy skin and coat condition, Dorwest Evening Primrose Oil is believed to have the ability to support normal hormonal balance, that can otherwise influence behaviour and coat quality. With no odour or taste, the liquid can simply be added to food, direct into the mouth or dropped onto the nose where it can be licked off.